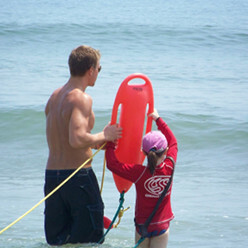 Lifeguards are on duty from 9:30am until 5:30pm daily. Roving Patrols (4wd trucks and ATV’s) travel from the county line, north to Penny’s Hill for your assistance. Always use caution before entering the ocean when in the Outer Banks. Be alert for Red Warning flags and Red & White Warning Posters. If the red flags are flying, it means swimming is prohibited, please pay attention to them. Although the flags may fly when the weather seems fine, it’s hard to judge if the water is safe. Ocean swimming is not like swimming in a lake or pool, as strong littoral currents, rip currents, tidal currents near inlets and shifting sand can make swimming dangerous. Please read the swimming safety tips at lifeguard locations.